Flight 1713 was cleared for a runway 35L takeoff, 27 minutes after de-icing. On takeoff, the DC-9 over rotated. The aircraft descended back and the left wing struck the ground, causing it to separate from the fuselage. The left side of the cockpit and forward fuselage struck the ground next and the aircraft continued to skid inverted. 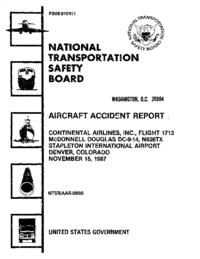 Both pilots were relatively inexperienced in DC-9 operations (captain: 166 hours on type, of which 33 as captain; and first officer: 36 hours on type). PROBABLE CAUSE: "The captain's failure to have the airplane de-iced a second time after delay before take-off that led to upper wing surface contamination and a loss of control during rapid take-off rotation by the first officer. Contributing was the absence of regulatory or management controls governing operations by newly qualified flight crew members and the confusion that existed between the flight crew and air traffic controllers that led to the delay in departure." Distance from Denver-Stapleton International Airport, CO to Boise Air Terminal, ID as the crow flies is 1024 km (640 miles).